Yes, it really is all it’s cracked up to be. At least it was when we were lucky enough to see it. As I said earlier in the week, we were incredibly lucky on Wednesday night when we stayed out until the early hours of Thursday, watching the aurora do its stuff. As I promised, here are some photographs from that experience. Starting off with an incredibly clear night, and a very subtle blue hour after sunset, the aurora began to show itself in the second photograph. Depending upon your eyesight and quality of the screen, you may be able to see the faint green mistiness in the middle of the photo. Within about 10 minutes or so, it had grown in strength, so that it started to get brighter and more intense. Eventually, as the night wore on, the show became even more amazing, as can be seen from the second three photographs. Now, these were taken using a sensitive sensor setting on the camera and with 8 second exposures, so the camera can record a lot more than can be seen with the naked eye. In fact, it’s almost impossible to record on a camera, what you can see when you are there. The first two of the second batch are pretty close, though. The third one there has been fiddled with a bit, but it seems that the amount of light produced by the aurora can be huge. It was easy to see one’s way, after midnight, just by the light from the sky. It is interesting to see, on some of the shots, just how far a satellite can travel in 8 seconds – several shots have bright lines, traced by the satellite, as the shot was taken. 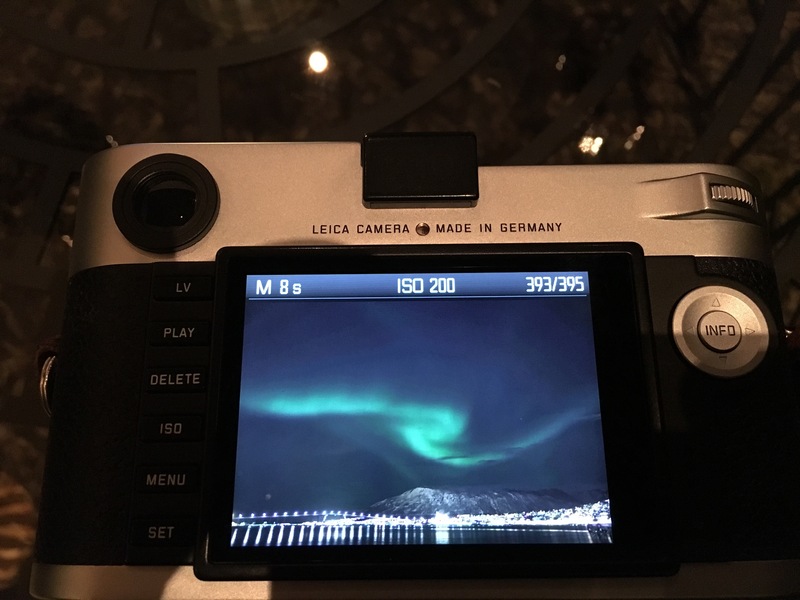 For those of you that might care about these things, the camera was a Leica M240 and the lens was a Leica 24mm Elmarit-M ASPH. So, now you know. 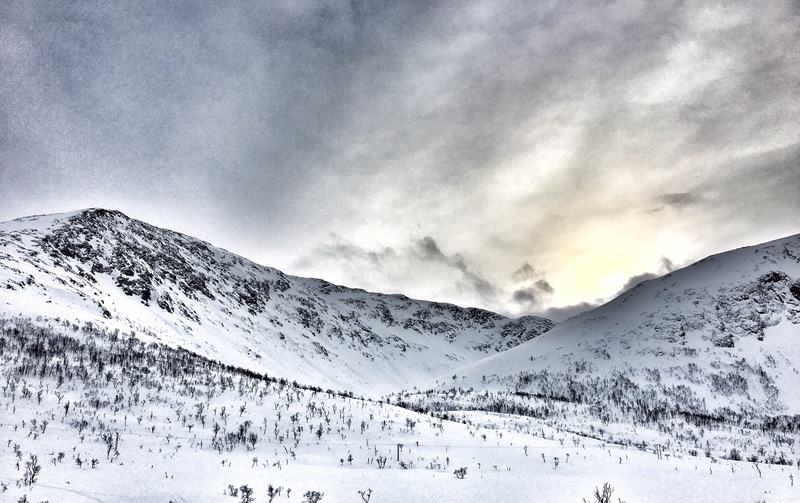 If you ever get the chance to travel north during the winter months, I do hope that the gods are with you as they were, north of Tromsø, last Wednesday. On Wednesday, we did the Chasing the Lights tour. 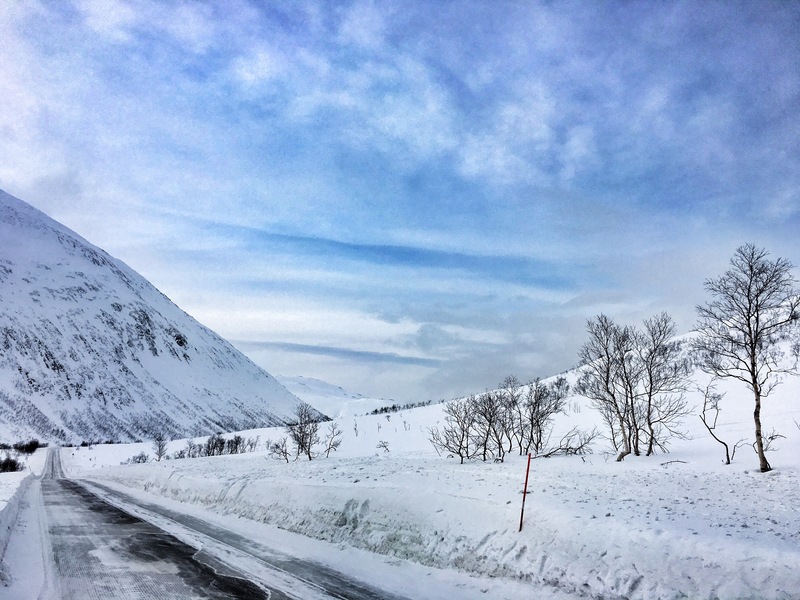 We were picked up at around 6pm and headed about an hour or so north of Tromsø, by coincidence to roughly the place we ended up with the hire car the day before. At first, things were not looking promising. The guide was no doubt deliberately talking down the possibility of seeing the lights – obviously nothing is guaranteed – but we headed off to a small cove, at the north end of an island. Grunnfjord, if you want to have a look on Google Maps. After about 15 minutes, one of our party spotted a pale, green smudge in the north east. Slowly this grew until the lights revealed themselves in all their glory. For a couple of hours, there was an arch stretching across the sky, from horizon to horizon. The intensity grew, and faded. The curtains effect revealed itself really strongly, and the lights went in waves along the line of the arc. Even with the naked eye, some of us could see a pink tinge to the edge of the lights, beyond the strong and dominant green. Even if you are colourblind, the visual experience would be amazing. We stayed out beyond midnight and, as we were thinking about packing up, as if in the finale of a concert, the aurora really showed us what it was made of. The whole sky, from edge to edge, in all directions was green. Patches were darker, some lighter. Whichever way you looked, there were moving streams through a paler green background. It really was incredible. We stayed there for over 6 hours – a really fabulous experience. This really is a stunningly beautiful part of the world and is worthy of anyone’s time ( and deep, deep pockets ) to visit. I think that this time of year might be perfect, as the snow is still on the hills and skies are a beautiful blue. So, now, as I sit here waiting, I have >1200 photographs to look forward to viewing and editing. I am hoping that pushing the camera to 2500 ISO hasn’t affected them too much. We will see, but I have never taken so many photographs on a week’s holiday before. Or any week, probably. Not all taken on Wednesday evening, some on the day when we had hired the car. I will share some here later in the weekend to encourage you to make the effort to come here. You really should. I am a lucky man. I’ve said this before, but as my life wends its way along its chosen path, it becomes more true day by day. I have a loving family, good friends, an interesting and worthwhile job. 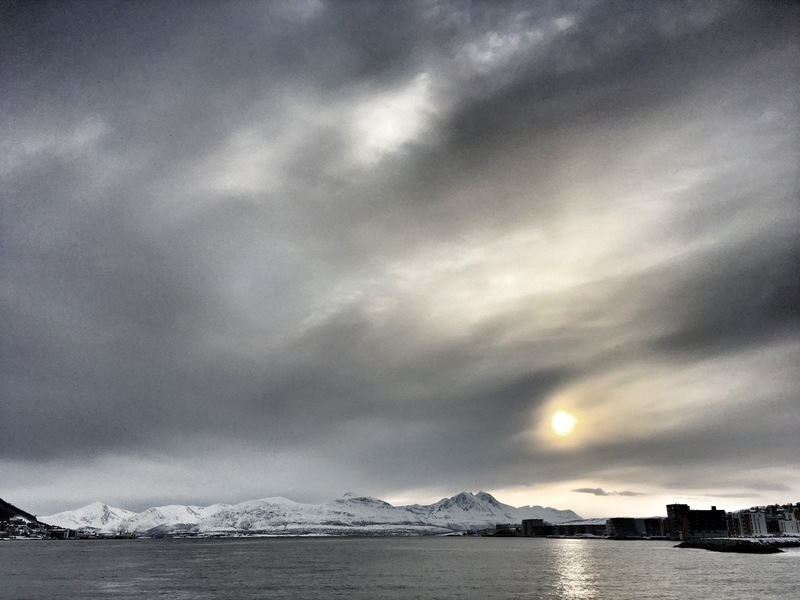 And, the evening we arrived in Tromsø, I saw the Northern Lights. Early evening, they were a faint but distinct vertical line. They stayed for around 10 minutes, then faded away, but Ann needed a lot of convincing that what we had seen really were the lights. I would have been happy with what we saw. I lay on the ground on a snowy concrete groyne, using my small table top tripod (should have borrowed the carbon fibre Gitso!) and the lights put on a great show. I took some photos (will share later) and then just lay on the snowy ground watching. And laughing out loud. I know that millions of people have seen them. And millions more will see them tomorrow, or next week. But, this is definitely one of those “remember the first time” moments that I will never forget. The small sample of fjords today certainly lived up to the anticipation. The weather improved during the morning and the scenery was just stunning. Later, at dusk, it turned foggy then snowy, but for the main part of the day it became clear and sunny. We drove quite a long way today, to make the best of the car hire but it was definitely worth it to see scenery like Scotland on steroids. Oh, yes… Nine quid for a small glass of wine from a wine box, is really not on. Norway really is cripplingly expensive. Not sure if I can ever afford to return. Which will be a great shame as it has so much to offer. It was a privilege to spend the weekend with our friends and their two boys in Oslo. 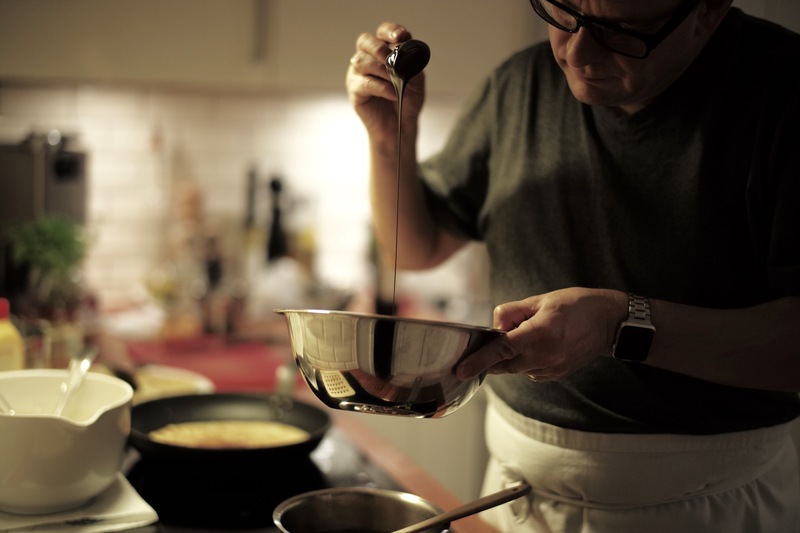 They were very kind and generous hosts and we had a great couple of days seeing the sights of the city and discovering that we could count a Masterchef amongst our friends. We were treated to some fabulous Norwegian specialities, including dried and salted cod and moose as a main course last night. That’s not something that we eat every day! (And neither do they, to be fair 🙂 ) His cooking really is exceptional. We had a great walk around the city, its parks and the castle on Saturday, with a lunch in a very nice cafe in the centre, before buying some oven gloves on the way home. Living the dream! We also went past a Persian rug shop that is unfortunately closing down due to the rent being tripled at the end of the year. Having almost bought a rug at 50% off, plus tax free savings too on export, common sense prevailed and we will wait until we get home to measure up the space that the rug will need to occupy. I have the business card of the store manager in my wallet, so I can email them to see whether the rug we would have bought is still in the shop. I am sure we can work something out when we get back. 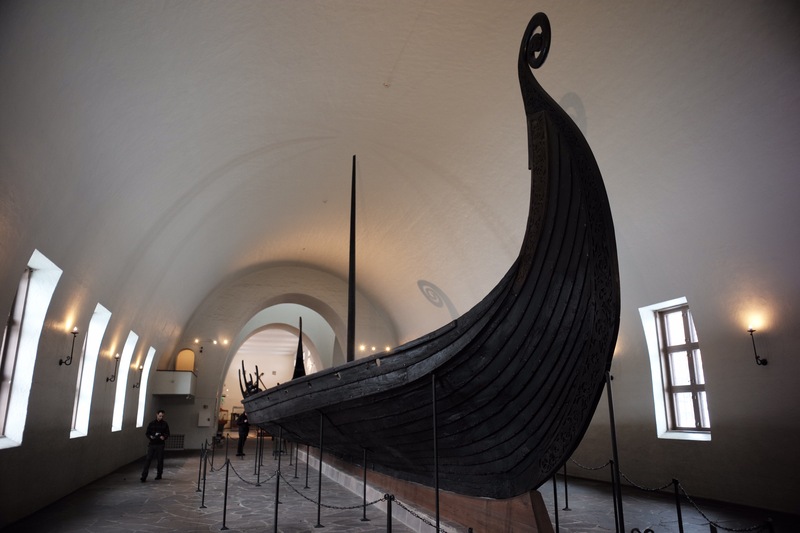 On Sunday, we went to various museums in the city, including the Viking ship museum where they have a beautiful ceremonial longboat from around 850AD on display, together with the queen’s funeral possessions that would have been on the ship. Absolutely superb carving both on the ship and in particular the funeral byre and other artefacts. A trip to see KonTiki followed, bringing back memories of Blue Peter in the 1960s. Why they were telling the story then, I don’t know, but you have to say that Thor Heyerdahl did lead an amazing life, proving that it is possible to travel around the world on ancient craft made out of balsa wood or reeds and string. Next door, is the Fram, the ship that Amundsen used to get to the South Pole before Scott, who obviously should have got there first! The ship is beautifuly preserved and well worth a visit. Finally, we went to the Munch Museum, where there is an exhibition of Munch and Mapplethorpe self-portraits (plus some of Mapplethorpe’s other work). Some readers may know Mapplethorpe, and others not, but the exhibition didn’t hold back on some of his more “challenging” work, not suitable for children. The really interesting aspect, and entirely down to the skill of the curator, was the remarkable similarity between some of the work of the two artists. Whether Mapplethorpe, a photographer from the late 20C had studied Munch’s work from the early part of the century I will have to find out, but the arrangement of the paintings and photographs was extremely well done. It was enjoyable visit and I would recommend it to anyone visiting Oslo in the next month or so. Munch’s most famous work, “The Scream” is in the National Gallery in the city centre, so that will have to wait until another visit to this interesting city. So now, at 35,000 feet above the clouds and the snowy landscape, we are off to Tromso. There was a solar storm last night, with the aurora being visible in the UK as far south as Oxfordshire, apparently, which is just typical! However, the forecast is pretty good for where we are going, so let’s hope that our luck holds out over the next few days. NCRI Consumer Group and more good news. At Christmas, the Lymphoma Association asked whether any of their consumer group members would also be willing to volunteer to become lay members of the National Cancer Research Institute Consumer Group. With the DIY works to the bungalow coming to an end in a few weeks time, I decided that I could afford the time to volunteer my services, if they would have me. Organisations like to have non-medical members to read and evaluate papers and reports and contribute to the process from a the viewpoint of someone who consumes cancer services, rather than provides them. Obviously I am rather hoping that I never have to be a consumer again, but I am happy to share my experiences and thoughts on whatever comes along. A couple of weeks ago, I attended an interview in London, and I am very pleased to say that I am one of the new recruits. Unfortunately, they are having a training session while we are in Norway, but I will attend the next one when they run it again in September and I am looking forward to the first meeting proper just before Easter. In a strange way, it is a really exciting time to be a cancer sufferer if you are lucky enough to be in remission from lymphoma. I know that my experience is not necessarily typical and that the picture is not rosy for everyone with cancer – far from it. But there is yet another article on the news today about how immunotherapy can be used to make the body deal with cancerous cells itself. I posted a few months ago about how chemotherapy may become a tending of the past in only a few years and today’s news appears to be a big step along that way. There was also news about switching on T-cells ( part of the lymph system and similar to but different from the B-cells where my cancer sits ) earlier this week. These cells can be tricked into fighting cancer cells elsewhere in the body, potentially avoiding the need for chemo or radiotherapy. It really does feel like we might be getting somewhere with this and I am hoping that my membership of the NCRI panel can help in a small way to moving this forward. Maybe it’s time to think about another cancer research charity book? Because, one day, we will get there. Friday morning, I’m sitting in seat 12B on flight BA 174 to Oslo, and, with a bit of luck and literally a fair wind, I am in the process of ticking off another Bucket List entry. We are spending the weekend with our good friends who live in the city and then, on Monday, heading above the Arctic Circle to Tromso. Having checked the weather forecast at least twice daily for the past week, we have a reasonable chance of seeing the Northern Lights on our overnight excursion on Wednesday, if not before. Provided that the solar activity is sufficient, too, of course. I have several fingers and toes crossed – you need a bit of luck if you are just visiting the north for only a few days. We will see. Preparation for this trip has been somewhat different from previous March weeks. Regular readers over the last nearly seven years will have seen that we try to take a week off in March. We have been lucky enough to be able to go to Venice, New York and San Francisco, to name a few, all of which have been interesting and great experiences. But all of them have a been to fairly temperate climes. In San Francisco last year we were in shirt sleeves and in Venice a few years ago, all we needed were a jacket or light jumper. This year will be different. I tried to liken it to a trip to the moon this morning over breakfast, but was told not to be ridiculous. Ok, perhaps that is putting it a bit strongly, but we have had to prepare somewhat differently this time. Whereas it would usually just be a case of taking normal clothes and coats,etc, this time, we have had to buy very flattering thermal underwear, merino wool fleeces and socks and padded jackets. We haven’t gone overboard on the jackets, but they’re not something that we would normally have bought. Really cold weather gear can be hired in the town itself quite reasonably, but even in Oslo, it is likely to be below freezing and snowing when we get there. 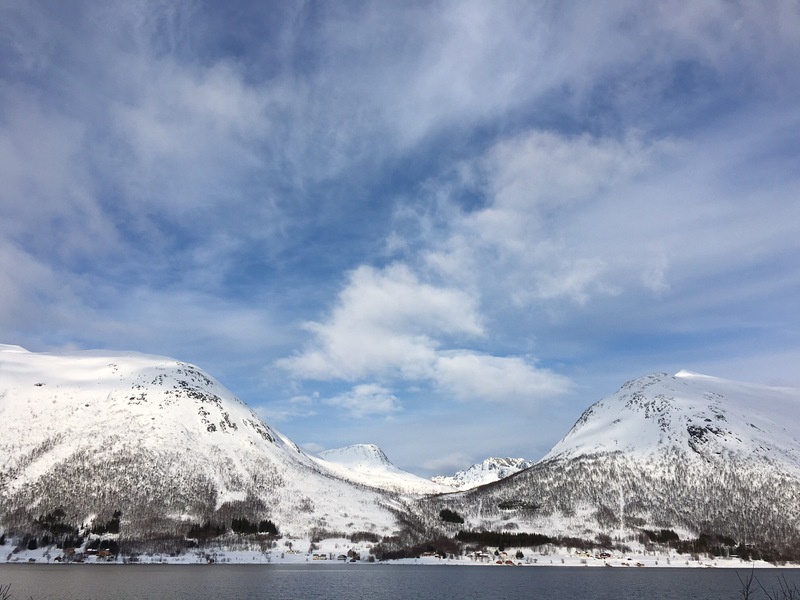 As well as the overnight minibus dash across Scandinavia, I have also hired a car for a day, so that we can explore some of the coastline and fjords and, with a bit more luck, find some photographs. I am looking for a couple to hang in the living room when it’s finished, so a fjord and an aurora one could make for a nice pair. So, this year’s March break is going to be a bit of an adventure into the unknown. I will post some iPhone pics along the way if there’s anything to share. My plan to compete all the works to the bungalow by Easter will not be possible, as the new French doors won’t be installed until the week after, and I will then need to lay the new floor, but we won’t be far off. Will need to sort out the bathroom afterwards, but that was always to be the last thing to do. It will be good to have the place done and know that we can move on to doing work in the garden over the spring and summer. If we can get the bathroom and the garden sorted by 13th August, we will be able to look back at a good year’s work.